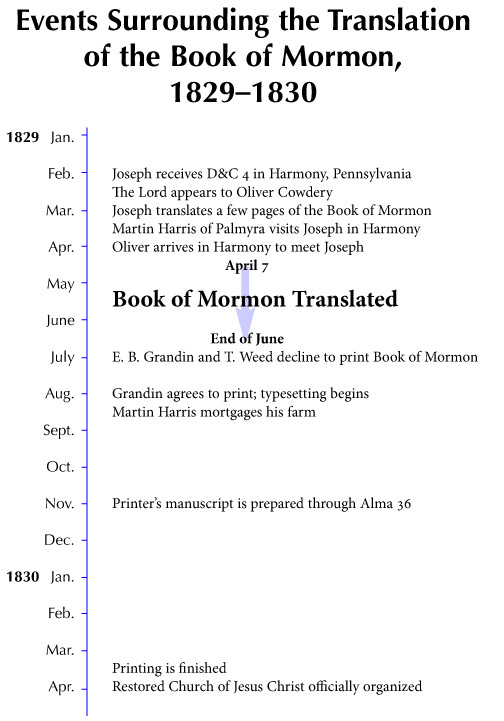 This chart, highlighting some of the events of 1829 and 1830, illustrates the sacrifices of those who were instrumental in helping bring forth the Book of Mormon in a miraculously short period of time. Oliver Cowdery spent the two months of April and May, 1829, in Harmony, Pennsylvania, assisting the Prophet Joseph Smith as scribe for most of the Book of Mormon translation. Prejudice against the Prophet made it difficult for him to find a willing printer for the controversial “gold bible.” Fortunately, Martin Harris gave much support to this cause, mortgaging his farm to secure payment for the cost of printing five thousand copies of the first edition of the Book of Mormon. Despite such challenges, in March 1830 the ancient Nephite record was published, opening the way for the organization and growth of the restored Church of Jesus Christ.